While researching tires, you may see the terms “symmetric” and “asymmetric” being used when talking about a tire’s tread. Wondering what the difference is between symmetric tires and asymmetric tires? We’re here to help! A symmetric tread pattern is one in which the inner and outer halves of the tire are equal, or symmetrical. The same tread pattern (grooves and blocks) is present on both sides of the tire. An asymmetric tread pattern is, of course, the opposite. The inner and outer halves of the tire feature different tread patterns. At first blush the asymmetric tire concept may seem somewhat odd. After all, the inner and outer halves of a tire contact the road surface equally, and therefore must manage the same road surface conditions, right? What’s to gain by making the two halves of a tire different and having an asymmetric tread? The answer: Greater performance diversity. Asymmetric tread patterns are an attempt to achieve high levels of performance in multiple areas. 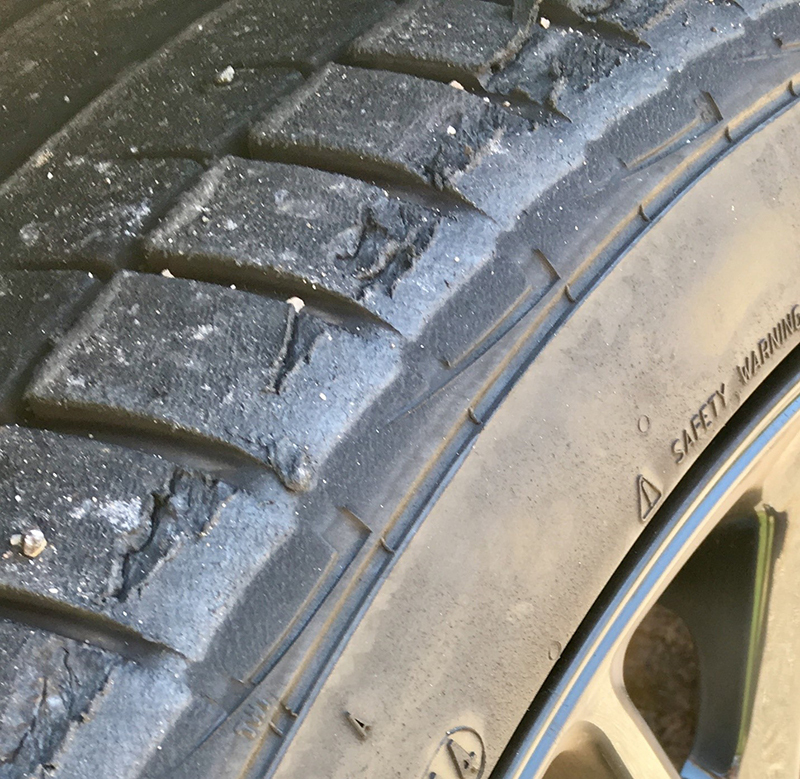 Looking at a tire in a parked, static position belies the fact that the inner and outer halves are not always subject to the same stresses and conditions when in motion. This is especially true when considering tires used by enthusiasts for spirited driving, and in performance driving environments. In performance contexts, asymmetric tread patterns can improve overall traction and facilitate a combination of dry and wet track performance. An asymmetric design can also encourage even tire wear, durability, and longevity. The outer shoulder is a common point of accelerated wear on tires used for track days and autocross events. The repeated high-stress cornering takes a toll on the outside of the tire, creating uneven wear or chunking as shown in the image below. With a symmetric tire, the inside and outside shoulder are equal. However, an asymmetric tire design allows for this particular point of accelerated wear to be addressed while handling other performance concerns on the inside half of the tire, and not unnecessarily fortifying each shoulder equally. The Cooper Zeon RS3-S, with its prominent outside shoulder tread blocks, is a great example of an asymmetric tire. Arguably the most successful high-performance summer tire in history, the Michelin Pilot Super Sport, also has an asymmetric tread design. Along with its asymmetric tread, the Pilot Super Sport actually uses a “bi-compound tread,” or different rubber compounds on the inside and outside of the tire tread. The outside of the tire features a compound that’s durable and engineered for endurance. The inner half of the Pilot Super Sport employs a high-grip elastomer that optimizes traction in wet conditions. 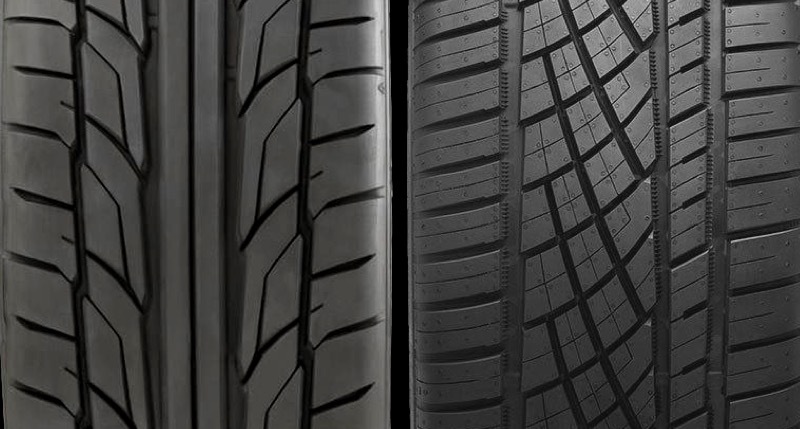 Asymmetric tread designs are also common in the high-performance all-season tire category. Here the asymmetric tread characteristics encourage strong handling and traction through all four seasons. The Continental ExtremeContact DWS06 is a first-rate example of an asymmetric high-performance all-season tire. The outside shoulder of the ExtremeContact DWS06 resembles what’s found on performance summer tires, and promotes cornering stability and durability. But unlike summer performance tires, other areas of the DWS06 tread are engineered to manage inclement conditions. The Traction Grooves and X-Sipes of the DWS06 help provide traction in wintry conditions. Is there a drawback to asymmetric tires? You may forfeit some tire rotation options that are possible with symmetric tires, which can be rotated to any position on a vehicle. Having more rotation options can potentially prolong the tires’ life. To sum it up, asymmetric tread designs are aimed at creating performance diversity and durability that isn’t necessarily possible with symmetric tread patterns. Does this mean symmetric tires are all duds, or “one-trick ponies”? Certainly not. Many symmetric tires hit upon the right combination of compound and tread design, and function exactly as advertised. It’s also the case that not every asymmetric design lives up to the spirit of the concept, and some may fall short in one or more intended performance areas. The very popular Nitto NT555 G2 is an example of a great symmetric tire. Whether tires are asymmetrical or symmetrical is something to be aware of when considering your tire options. This variable probably shouldn’t drive your tire purchase decision, but awareness will help you understand rotation possibilities (or lack thereof) and potential treadlife. Understanding the tread characteristics and design can also help you predict whether the tire has been engineered to tackle everything that you have planned.